It’s time for a new post. I’m writing this in the midst of exams. For quite a lot of people they’ll be able to relate directly either having exams at the moment as well, or by the fact that they too have had exams recently. It’s often in periods like this my mind gets a bit muddled and confused. Wondering whether there’s much point in the exams at all. And obviously the endless hours of procrastination don’t help. This most definitely isn’t a self help post! I’m no guru, as I too get muddled (far too often as it happens). I find myself traipsing the internet in search of stuff to cure my inane boredom that the revision has generated. I always find this odd. As i’m normally someone who enjoys learning about my subject but put it in the context of revision and it all too easily becomes mind numbing and dull. So throughout this exam period I’ve tried, as best I can, to make sure this doesn’t happen. Evidently (as this post shows) this doesn’t always help. And procrastination quickly sparks back into life. So here I am to not help but tell you how I go about procrastination. Which will hopefully give you something to relate to. But maybe also it will give you something to aim for. facebook, twitter, instagram, snapchat, youtube, yikyak, food repeat…. and this is a cycle which normally occurs 3/4 times in a row. For most their procrastination will be similar, and with our lives so fuelled by social media it’s easy to get lost in this amongst all the revision. My new method, however, isn’t solving the problem. Or in anyway making me revise more but it is helping to renew my enjoyment for the stuff that i’m learning about. It’s all about exposure to your particular interest or subject even whilst you’re on a “break”. In my periods of procrastination, where I’m sat flicking through my phone or laptop I now try to focus it on parts of my subject that I enjoy outside and away from the stuff I’m actually learning about. The other day I was studying for a module on geological hazards, the break I gave myself was watching news footage from landslides in Nepal, whilst also watching a video on the causes of landslides with clips of them in action all whilst I was on youtube like I would be normally. For me seeing particular parts of the subject in action brought it to life a bit more, allowing me to apply what I was learning. Now having said that, this was a very specific part of my module that I was able to directly link to something both: less tedious and semi-productive. For other parts of my exams and for other people’s subjects this may not be possible. My girlfriend makes sure she’s always liking new neuroscience pages on facebook so her feed is less cluttered by junk and more engaging with news articles and posts she wants to read in her time off. She also does this through twitter where she directly follows neuroscientists and specialist hospitals which tweet regularly about the goings on in her field. I’m lucky enough that companies like Wired often post about the updates in geography but this is due to the subject itself having such a broad focus. On most occasions the updates aren’t relevant at all but it’s small things like this that you notice while scrolling through whilst procrastinating. Maybe they’ll be something similar for a topic you’re studying? A tweet that wired did a little while ago relating to something I was studying at the time. I don’t reckon my procrastination will ever go away, but if you do find out a method that works for you be sure to let me know as I need any help I can get! Despite all of this I do feel that my procrastination has gotten better. It’s more focussed and structured, sort of like my revision sessions are. I may be scrolling through twitter or just browsing the web. But by increasing my exposure to sources relevant to something I’m interested in but also related to the exam it does make me feel like I’m slowly improving. Don’t give up on revision entirely, it’s the only sure fire way of upping those grades. But if you’re like me and maybe want to feel less miserable or muddled due to the fact you seem to be wasting so much time in the run up to exams. Maybe do what I do? Exposure is everything, even if it isn’t a self made card or a lecture slide. We’re always learning even if we don’t think we are! I enjoy planning things. It gives me a sense of excitement, which you don’t ever get if you’re just sitting still plodding along with life. It’s like a journey which wouldn’t be enjoyable if you never got anywhere at the end of it. 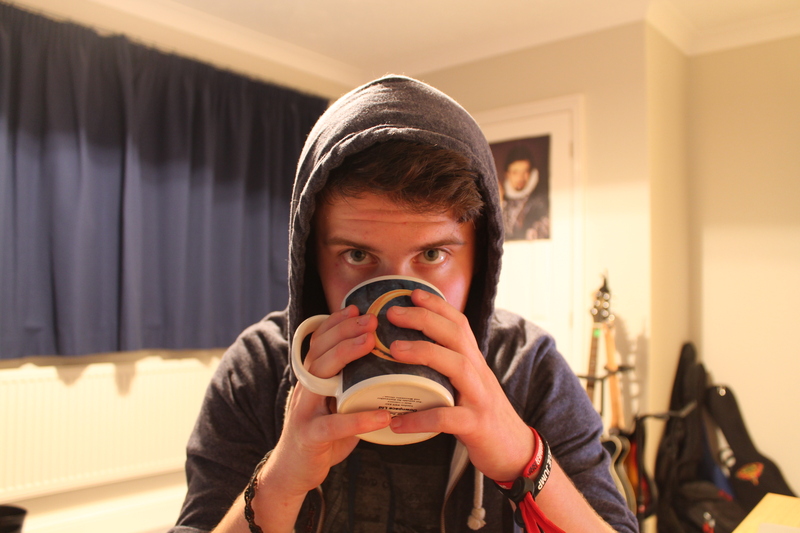 Obviously at the moment I’m rather bogged down with exams! (Which is funny as I’ve just restarted this blog again). But one good thing that does come with exams is the post exam period bliss. From the moment you walk out your last exam to the first day back at uni or school. You have a period of uninterrupted time to choose what you want to spend your time on. Planning of such time is one of the things that keeps me going through exam period (whilst also distracting me from that much needed revision). BUT none the less it is something, which hopefully actually improves my marks, giving me something to look forward to once it’s all over. So I thought I’d talk for a moment about some of the plans I’ve made currently. The blog is all about “living the adventure” and how I hope one day to fully achieve that. It would only be right then that the brief time I get away from uni or responsibility is fully spent trying in small ways to achieve that goal. Firstly I’ve got the end of uni mandatory socialising. Including the celebratory Dominoes (yes I’ve already started planning it) and a trip up to Leeds for their ball at the end of the year with my girlfriend. , the New Forest and possibly Winchester if we get enough time. I’m yet to properly have days out since I’ve been at uni, when i’ve had breaks it’s normally been going home, or up to Leeds. and sunny su mmer there which is lovely and hopefully one of my other friends is aiming to be there at the same time. So along with the cultural heritage that Rome will provide we can spend some time relaxing in the evening over a pizza or a alcoholic beverage or two. A few weeks after Rome, my cousin is getting married and i’m also lucky enough to be going on my usual family holiday down to Devon. Exciting times! I just have to make sure I can get through these exams first I guess. Then I’ll be free to properly enjoy all these plans that I’ve been beginning to make. I’ll be hoping to share as much as possible over the next few months exactly what I manage to get up to in my time off from my studies. If you want to find out about any more of my plans send me a message or leave a comment. Also I’d love to hear from you if you’ve been making plans yourself! I’ve always been useless at updating blogs and other social outlets. Always doing them for a month or two, getting really into them with it all going really well. Then out of nowhere I just seem to lose the incentive to do it any more. Now i’ve been trying to figure out exactly why this would be the case. Now these are all rather big things. All of which have happened so quickly. Every single one within the space of a year. I actually thought I’d be able to continue writing despite all of these things but gradually over time I began to lose interest. The fast pace of life these days means that any spare moment I get I just want to relax. And that’s where I think I’ve gone wrong. I don’t want to relax. I want to always be on the go! To always be pushing my self to the next level. So at it’s core, it’s all due to this change that’s led me to stop start and close blogs in the past. I never have a place that I want to continue and make truly my own. Where I can just dump all my thoughts! Which is kind of what I need, I need somewhere that I can ignore the rest of the world. Now I’m not saying this blog will be that place, but I guess reviving it and somehow starting something again will push me towards my goal of living the adventure. Now I can’t commit to any schedule of posting. I’ve got a hectic student life consisting of work, socialising and sleep. But I want to promise this time round that I’ll be able to push on through the gaps of no posting by scheduling posts and working out a routine where I can fit it in nicely around my studies and my sleep pattern. I’m hopeful as well that by focussing on some new topics in the blog and by revamping the site itself I can focus on what’s most important and that’s enjoying my blog whilst pushing myself to run the blog that I want to run. Also worth noting how this is working out to be a great procrastination method, so now this has been written I should probably get back to some revision. A few days ago, my friend and I ticked making our own pizza off our list of things to do! I’d like to point out how I am most certainly not a cook so for me it was all about following the recipe exactly. We were still able to be flexible around it, choosing our own toppings and preparing it exactly how we wanted etc. I’ll describe the process of us making this pizza and hopefully in some way you’ll find it both entertaining and useful. We met at the supermarket in town. The place where we’d go about grabbing all the tasty ingredients we were going to shove in our pizza. I, however, thought it was necessary to start with a caffeine boost so I grabbed an iced coffee to give me that quick improvement. Once I was up and raring to go we collected a small basket and head into the depths of the supermarket. Armed with only a basic set of ingredients we grabbed the general stuff needed first. The flour, tomato sauce, cheese and strong bread yeast. These would make up the basic pizza, producing an adequate amateur pizza; for us, however, this was not enough. We’d filled up our basket slightly, not spending too much except on the quite expensive mozzarella cheese. For toppings we decided to choose some parma harm (expensive but definitely worth it) and then a mixture of vegetables to add a bit of colour to our pizza. 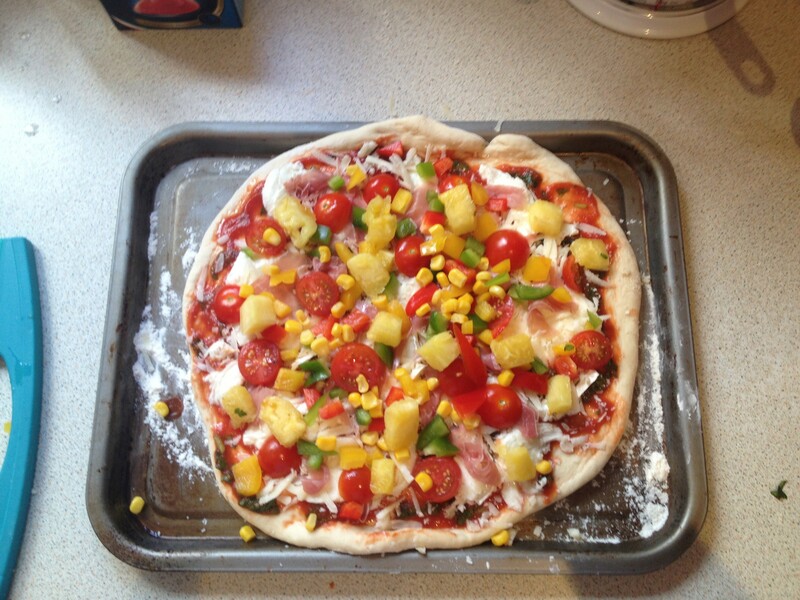 For the additional toppings we chose, a selection of peppers, some basil, some sweetcorn, some tomatoes and some pineapple. Then to flair the base up a bit we bought some goats cheese to put between the pieces of mozzarella. Upon getting home we put certain items in the fridge and then began preparation. We started with the base, measuring out the flour and mixing it with warm water and yeast. We found more yeast was needed to make sure the pizza rose properly. (thank you internet) Once finished with the combining we were able to start kneading, whereby you try to get rid of all the air inside the dough…. Sadly, I took charge of this and wasn’t the most successful as we ended up having an area of our pizza that rose a fair way. We mixed together our sauce, adding much more tomato than was probably needed but we wanted a nice think sauce with our pizza. I’d throughly recommend that anyone who goes about making a pizza puts more into the base coverings than they think they’ll need just to properly cover the pizza evenly. Rolling the pizza is always fun and then spreading the base covering is incredibly satisfying, I see why people want to go into the pizza business. Whilst this was going on my friend took over the role of sorting out all the toppings, so by the point I had completed the base of the pizza everything else was ready to go on. Definitely a 2 person job creating such a magnificent work of art. So we delicately applied each of the toppings, scattering them in a random yet perfect pattern. We had created a masterpiece! We let it cook for 16 minutes, 6 more than the recipes recommendation only because we had a slightly thicker base as that was the style of pizza we wanted. I didn’t really want to deviate from the recipe as I thought it was a disaster waiting to happen but I reluctantly agreed. Now it’s done I’m so glad I did, the pizza was perfect. Hot, well cooked, and slightly singed for showing perfect cooking time. The only bad bit, was the air bubble which had rise. I’ll accept blame due to me being the one who was doing all the kneading earlier. 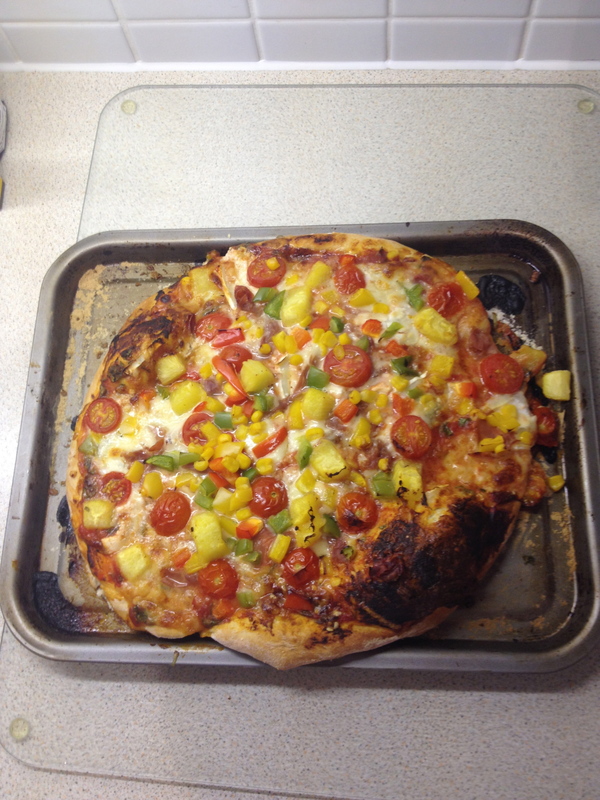 So ignoring the slightly burnt bit, our pizza actually looked rather impressive. It even tasted pretty good! Food definitely tastes better when you’re the one that’s cooked it, it’s as if you can taste the effort some how. A sterling effort by us, no doubt we’ll be doing plenty more cooking of pizzas now we’ve done one. We had the idea of doing a more meaty one and maybe even attempting a four seasons. It’s summer. The time of year when the shorts can come out and the shades can be put on. Everyone loves summer, the weather gets better and it seems to put everyone into a better mood. For most it means a holiday or time off work and at least one BBQ will be on. It’s also a time to catch up with family or meet up with friends to enjoy the weather and the mood. In the UK this means BBQs, trips to the park, summer parties and pimms. I’ve been on a break for a little while now, having gotten back from exploring Europe a few weeks ago. 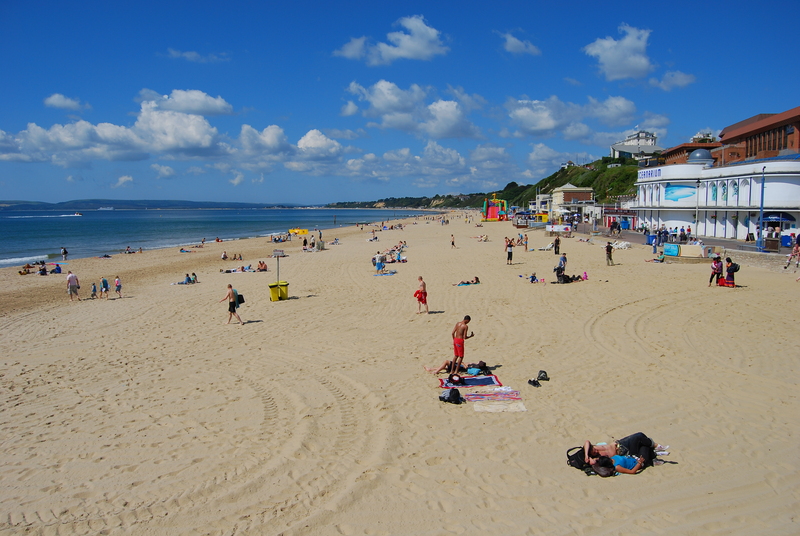 In that time, i’ve been a stereotypical british summer lover, trying to enjoy each of these things as much as possible. Recently, however, summer wasn’t quite so perfect. On Friday the 25th of July I had planned a lovely set of summer activities only for the plan to go down the drain. 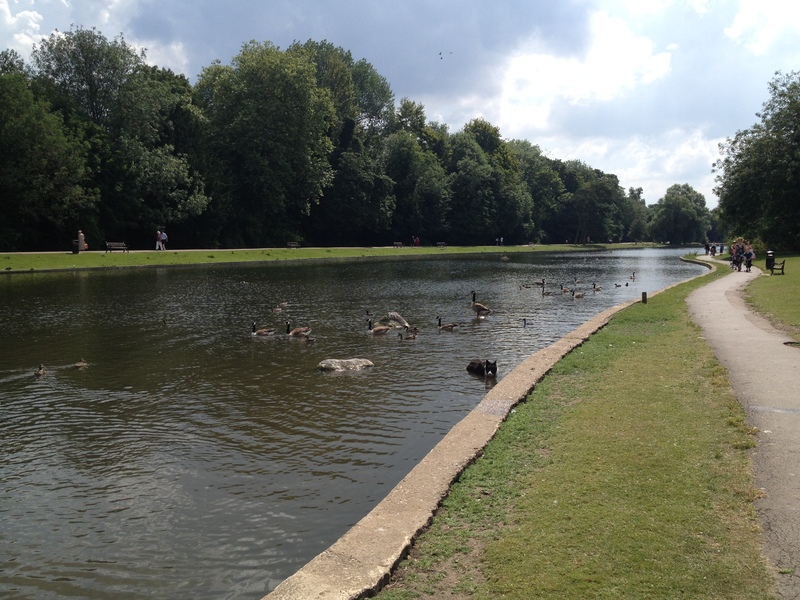 I set off with a friend into St.Albans, a small city to the north of London. The plan was a nice stroll around the park at midday, to end up at a restaurant and then go from there. It started perfectly, the weather was delightful! The sun was shining, there was barely any wind but enough to keep you cool and the park wasn’t nearly as full as it could have been. We took a gentle stroll, chatting about recent goings on in our lives, walking full circle several times around the centre point of the park, the lake. It’s not nearly as grand as other cities, but it holds it’s own. It was coming up to midday and so we were getting slightly peckish so we walked about 5 minutes to the Waffle House. The Waffle House is a great restaurant offering a selection of savoury and sweet waffles. We chose to share a ratatouille waffle and a banana and flapjack waffle. I got stuck eating the sweet waffle first which my taste buds didn’t approve of. But I’d recommend both the waffles for anyone that’s able to check out the restaurant. 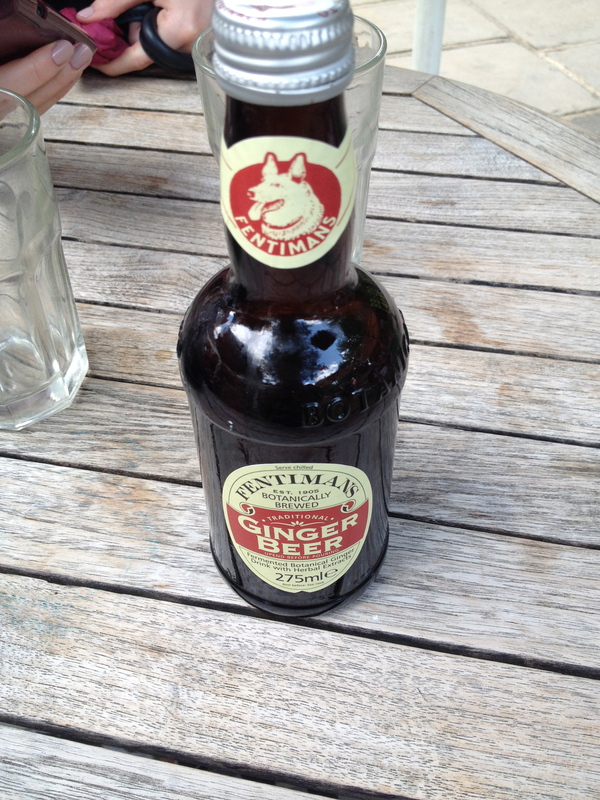 Alongside my meal I got a fancy ginger beer brewed by Fentimans, as a lover of ginger beer I throughly suggest anyone that even slightly likes the taste gives it a try. It’s quite a select taste but anyone that enjoys ginger beer will enjoy this one also. Thankfully we got in before everyone else in the park decided to grab lunch so we sat and watched as the queue racked up. Even spotting a few friends waiting and having a short word. We were lucky to get in early as the queue was easily 15-20 minutes for a table. So our one suggestion is that anyone thinking of going should try to get there on time or at least book ahead to make sure you get your table. After the meal we wandered back into the park to try and soak up the rest of the rays. We didn’t have much with us so we were able to walk further into the centre of the park to a great spot on a slight embankment to catch some sun. However, as we were sitting enjoying the park, the weather quickly turned. This consisted of clouds forming all around and a slight bit of drizzle. This quickly passed and so we were able to resume our park chill session. Then, around 5 minutes later, it started to rain a bit more. This time round we quickly grabbed our stuff, head under a tree and proceeded to watch as most other people in the park did the same. Half expecting the rain to stop like last time we waited under the tree for around 10 minutes hoping the rain would come to an end. It didn’t. The rain began to get heavier and heavier, even a bit of thunder could be heard in the distance. I looked at my friend and we both realised we were in a tricky situation. We hoped it would pass and put our trust in the weather to brighten up and not ruin our day. Again, this didn’t happen. We were now trapped under a tree with relatively no protection. I was wearing just a t shirt and shorts, which were already starting to get quite wet. To make matters worse the rain was worsening. It worsened so much, you couldn’t see anything beyond 7 or so metres away. It was coming from all angles and the park offered no clear points of protection. We were soaked to say the least. Our hair was wet and our clothes ruined. So in a ridiculous moment we walked out into the rain along a row of trees trying to find somewhere of shelter. I managed to lead us to the local swimming pool (we were the wettest ones there) and we stood calmly in the foyer of the building looking slightly perplexed. How was everyone else here so dry? We’d seen others also caught in the storm but how come everyone was perfectly fine. We weren’t drying, my phone had some water damage and we weren’t in the mood to continue our trip into town for a smoothie or milkshake. So after trying for a while we contacted home and managed to be rescued. It’s fair to say we’ll both be more careful when heading out and about this summer, you never quite know what the world has in store for you. I’d love to hear any of your crazy weather stories, comment them below or tweet me. Welcome to my blog, currently it’s fairly basic, there are few if any posts and barely any photos to catch your eye. This may put you off taking an interest in my blog but it is just the beginning. I have a passion for a wide variety of things. Culture, travel, photography, design and technology to name just a few. This blog aims to focus on all of these things individually and then how they all mash together. I hope that my writing will hopefully be entertaining and give you a glimpse of some of the passions that I have in my life. The aim is to update this blog as regularly as possible. And i’m keen on engaging with everyone reading the blog so tweet me some stuff you’d like me to cover and I’m sure I can. It’s exciting for me heading out into the wonderful world of blogging. I can’t wait to start posting properly and I hope you guys will enjoy what’s to come.